A comprehensive two-dimensional liquid chromatography system in combination with photodiode array and mass spectrometry detection was developed for analysis of polyphenols in sugarcane (Saccharum spp.) leaf extracts. To achieve this, a micro cyano column and a partially porous octodecylsilica column were used in the first and the second dimension, respectively. The choice of the cyano column over other reversed-phase columns tested for the first-dimension separation was due to its lower correlation selectivity with respect to the octodecylsilica column, which was used for the second-dimension separation. Even when reversed-phase mode was used in both dimensions, a satisfactory degree of orthogonality was achieved by use of different gradient elution modes in the second dimension. By means of the setup investigated, 38 polyphenolic compounds were detected, and among them 24 were positively identified by means of complementary data from photodiode array and mass spectrometry detection and an in-house database. 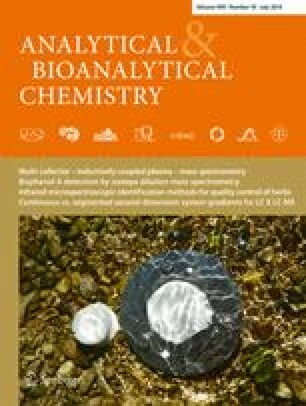 This is the first time such a powerful analytical technique has been used for polyphenolic characterization of sugarcane extracts. The authors gratefully acknowledge Shimadzu and Sigma-Aldrich/Supelco for their continuous support. G.M.L. thanks the Conselho Nacional de Desenvolvimento Científico e Tecnológico for a scholarship (process number BEX 5605/13-0).